Last week, I wrote an essay called, "Housing Is Up Big... And It's Still a Great Deal." I showed how house prices aren't much different today than they've been over the long run – when you adjust for inflation and square footage (houses have gotten bigger). I got an intelligent note – from a flustered subscriber – saying that I've got it all wrong. What you're missing terribly is that incomes have not risen to keep pace with inflation since the 1980s. Had wages kept pace with that inflation, homes would still be affordable, as you say. But they haven't. He says my article "ignores the bigger picture. Housing is in a bubble. Just like the stock market." What do you think? Do you think housing is in a bubble? The subscriber is mostly right about U.S. household incomes. 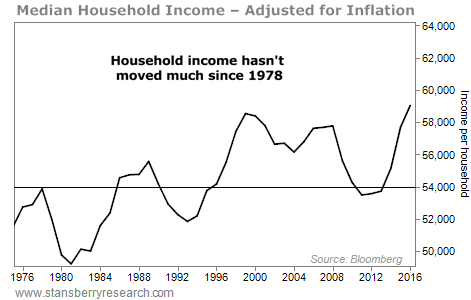 So the subscriber is right that household incomes haven't gone up a whole lot. 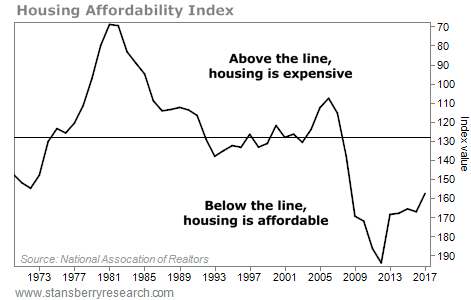 But he is wrong about affordability. People make a home-buying decision based on the monthly payment – not the house price. They ask, "Can I afford this monthly payment relative to my income?" 1. The median monthly payment (which we can determine based on the median house price and the current mortgage rate). 2. The median household income. Your mortgage rate is a huge factor in your monthly house payment. This chart shows just how punishing mortgage rates were back in the early 1980s. They were in the high teens... And as a result, houses were incredibly unaffordable back then. The chart also shows just how extreme the housing bust was into 2011... and how affordable houses were after that, relative to history. 2011 was the buying opportunity of our lifetimes. Today – thanks to low mortgage rates – housing is still affordable in my book. The median monthly payment relative to the median income is still attractive. Yes, house prices have soared a lot since 2011. That's a fact. However, nearly everyone I know wants to draw conclusions... They want to change "up a lot" to mean "expensive" or "in a bubble." That's how everyone thinks. But in my decades of studying and writing about the markets, one of the biggest lessons I've learned is that "up a lot" does not mean "it's expensive" or "it's a bubble." I realize I am not going to change this subscriber's mind. But I wanted to share his opinion with you. And I wanted you to see how I think about it. House prices are up a lot – yes. But houses are not overpriced yet... far from it. As Steve shared last week, housing is still affordable in the U.S. today... "Prices are actually just around their 45-year median," he writes. "We still have plenty of upside left." Check out his essay right here: Housing Is Up Big... And It's Still a Great Deal. If you're interested in buying a rental property, you need to know where the best opportunities are today. In this essay, Steve shares a few tips from a real estate expert and longtime friend. Read more here: Where to Invest in the Best Rental Houses. We're talking about World Wrestling Entertainment (WWE). This popular media and sports-entertainment company sends programming to 800 million homes across 180 countries. 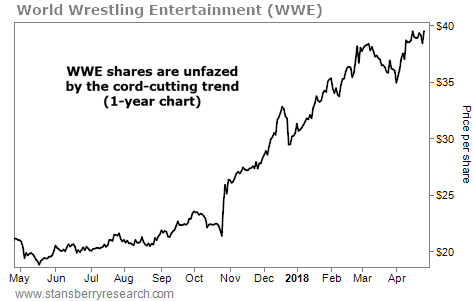 Earlier this month, the company's digital streaming service – WWE Network – reached a record 2.1 million subscribers, a 9% increase over last year. Added to its partnerships with streaming services Hulu and Facebook Watch, WWE's multiplatform content strategy is paying off... Revenue for 2017 also reached a record $801 million.